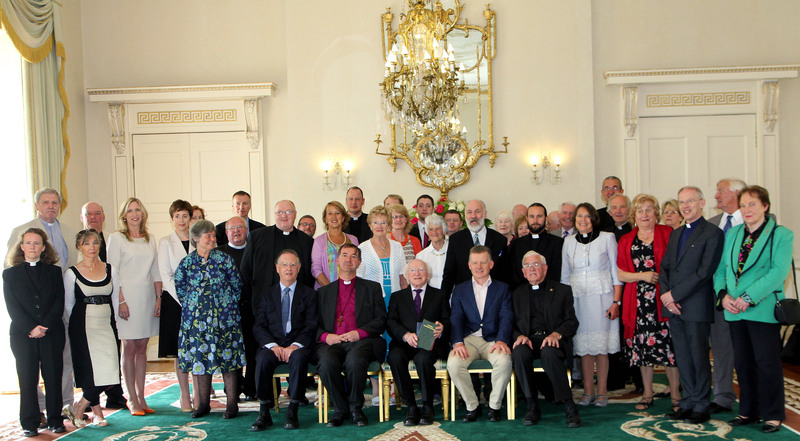 On Tuesday 24th June, 2014, a number of clergy and lay people from the United Dioceses of Cork, Cloyne and Ross, were part of the group from Cumann Gaelach na hEaglaise (The Irish Guild of the Church) who attended a reception at Áras an Uachtaráin. The President of Ireland, Michael D. Higgins, hosted the occasion at his official residence to mark the centenary of the establishment in St Ann’s Church ,Dawson Street on 29 April 1914 of Cumann Gaelach na hEaglaise. It was founded to promote the use of the Irish language in the Church of Ireland. Representatives of Cumann Gaelach na hEaglaise pictured with the President, Michael D. Higgins at Áras an Uachtaráin. Among those present from Cork, Cloyne and Ross were Canon George Salter, the Reverend Tony Murphy, Máire Ní Chríodáin (teacher at Ashton School, Cork), Ms Máire Roycroft, and Aonghus Dwane, together with others who formerly worked in the Diocese with strong Cork connections: the Venerable Robin Bantry White (former Archdeacon), Bishop Michael Burrows (onetime Dean of Cork and Rector of Bandon) Trevor Sargent (onetime Principal of the Model School, Dunmanway), and Hilary Pyle (whose late husband the Very Reverend Maurice Carey also served as Dean of Cork). This entry was posted in Church of Ireland, Ireland, Irish Language, Special Events. Bookmark the permalink.